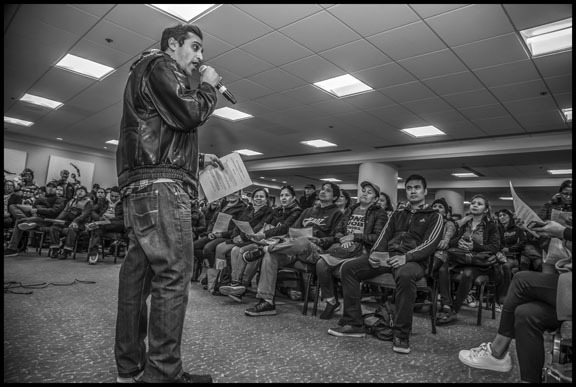 UNITE HERE Local 2 representative Rafael Leiva tells strikers at the Saint Francis Hotel that a settlement has been reached in the Marriott strike.To hear their own accounts of the strike and why the union won, read Truthout’s exclusive interview with UNITE HERE Local 2 President Anand Singh and UNITE HERE Local 2 organizer and Marriott campaign coordinator Kevin O’Connor, posted yesterday on this blog. Click here. 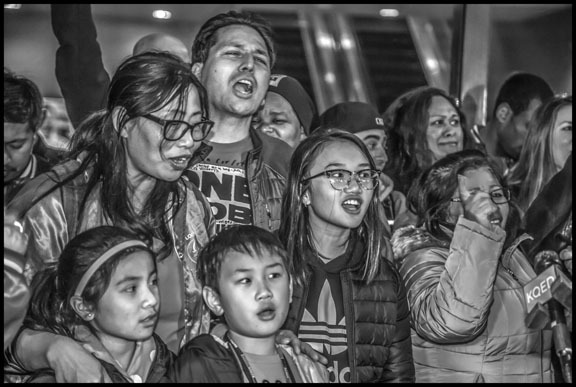 For 61 days members of UNITE HERE Local 2 struck at seven Marriott hotels in San Francisco during a national campaign targeting the world’s largest hotel corporation. The San Francisco union was the last to settle and go back to work. 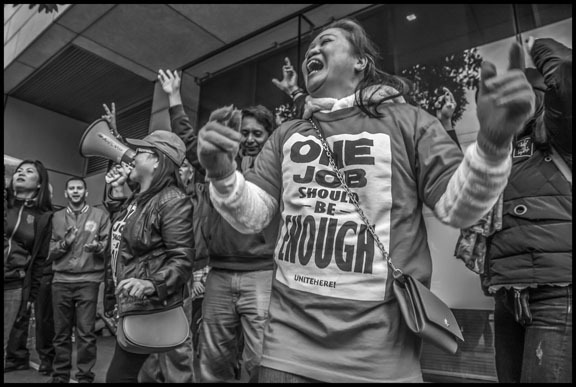 Room cleaners won a $1.75 per hour raise retroactive to last August, and significant raises in the next three years, while fully employer-paid health care is guaranteed for the life of the contract. Housekeepers won workload reductions. 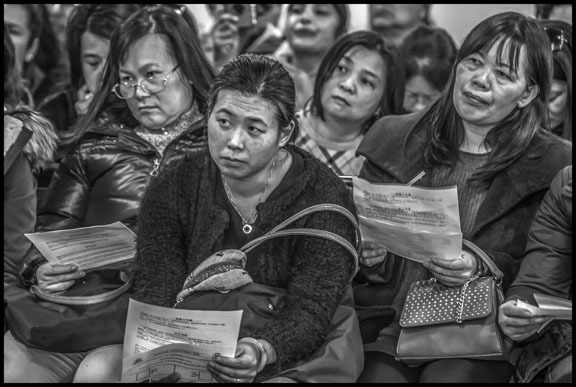 The new contract strengthens workers’ rights around the introduction of technology in the workplace, the “Green Choice” program, sexual harassment of room cleaners by guests, employee safety, and immigration. The strike stopped Marriott from contracting out room service and food service in a number of hotels. In San Francisco, workers won unprecedented job protections – if they’re laid off their names go into a pool where they’ll receive preference for rehiring at other hotels. The agreement was the result of the strike’s meticulous planning and the participation of workers in the seven hotels. In four hotels, not one Local 2 member crossed the picket line. Only a few did in the other three hostelries at which workers were on strike. 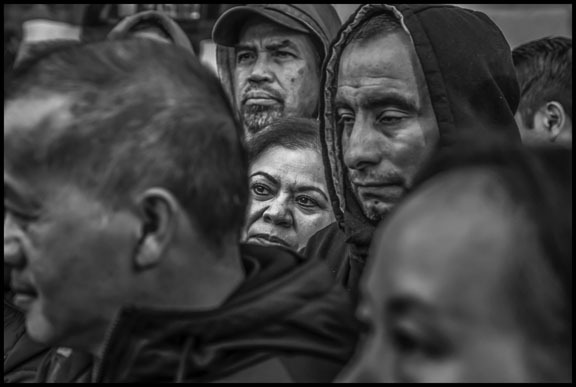 The images in this photo essay were taken on the last day of the strike. 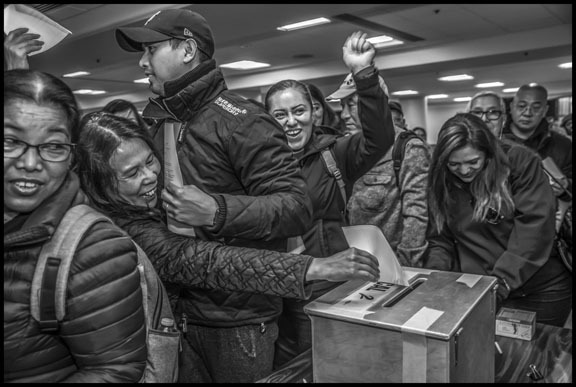 In the photographs, the workers react on the picket lines to the end of the strike, weigh the proposed agreement, vote on it and then celebrate it. Saint Francis strikers listen to an outline of the strike settlement on the picket line on the last day of the strike. 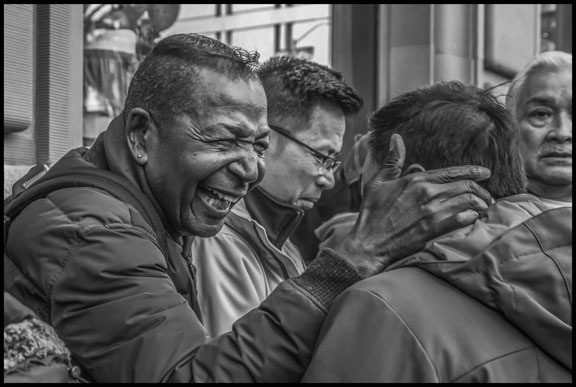 Striker Richard Mason, one of the longest-term workers at the Saint Francis, shows his happiness on hearing that a settlement has been reached in the Marriott strike. In front of the St. Regis Hotel, striker Camucha King and other Local 2 members celebrate the end of the strike. 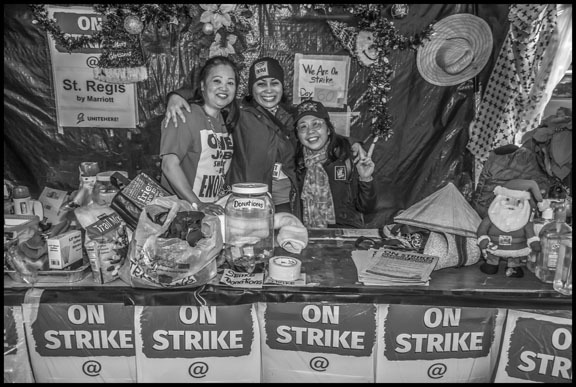 Strikers celebrate the end of the strike at the St. Regis Hotel. 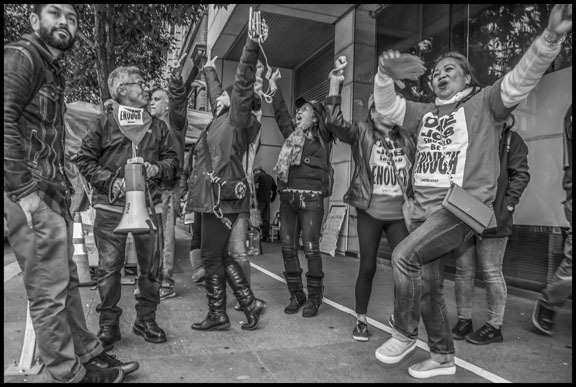 Camucha King and other St. Regis strikers put up Christmas decorations on their picket line when Marriott Corporation stonewalled negotiations at Thanksgiving, as a way to tell the company they were prepared to continue the strike through the holidays. UNITE HERE Local 2 Treasurer Tina Chen and other Local 2 members and organizers with their picket signs celebrating the 61st and last day of the Marriott strike. 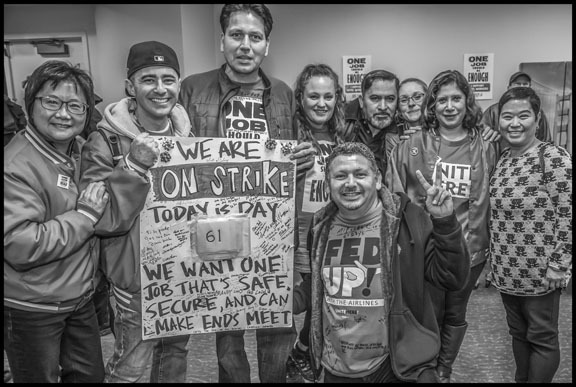 Local 2 members stayed on strike longer than any of the other eight cities involved in the national Marriott strike. 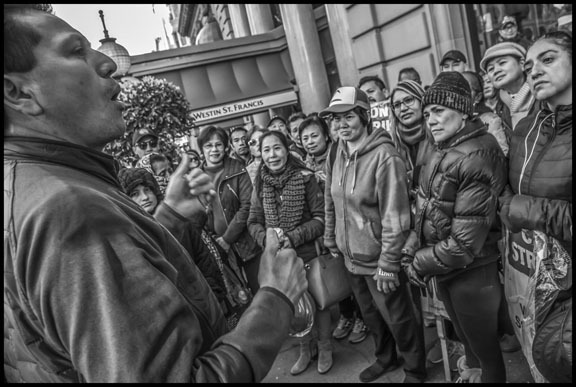 UNITE HERE Local 2 President Anand Singh explains to strikers in detail the contract settlement agreed to with the Marriott Corporation, ending the strike at its seven San Francisco hotels. Nonunion workers at the downtown JW Marriott Hotel come to the contract ratification meeting ending the Marriott strike, asking strikers to support them in their unionizing effort. 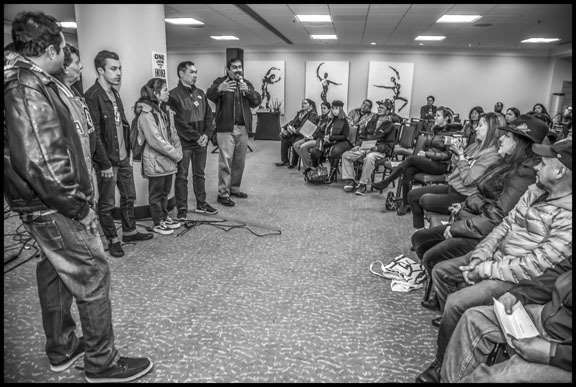 Marriott strikers listen to the explanation of the terms of the contract settlement ending the strike. 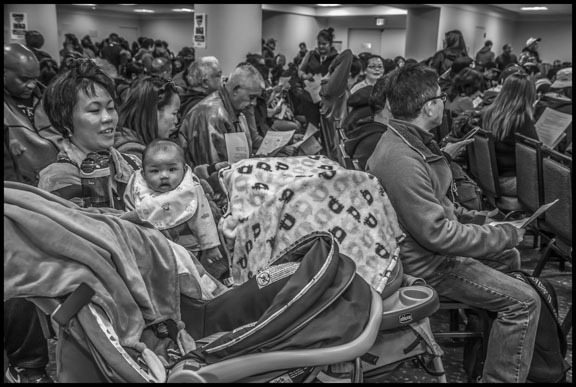 Hotel housekeepers bring their children and infants to the strike ratification meeting. Strikers vote on whether or not to accept the contract settlement. Happy over the gains in the contract ending the strike, strikers turn their vote on the agreement into a kind of celebration. 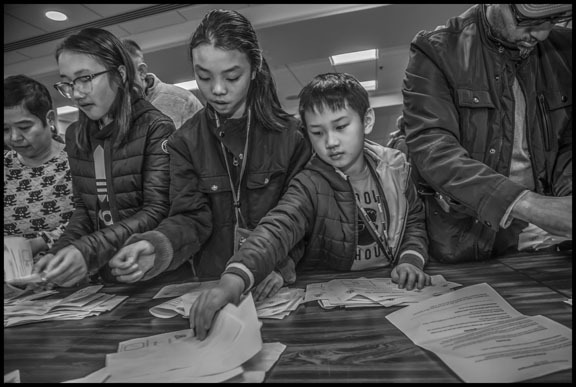 The children of strikers help count the votes on the ratification of the contract settling the Marriott strike in San Francisco. The vote to ratify the contract is almost unanimous, with only a handful of votes against and over 1,000 in favor. 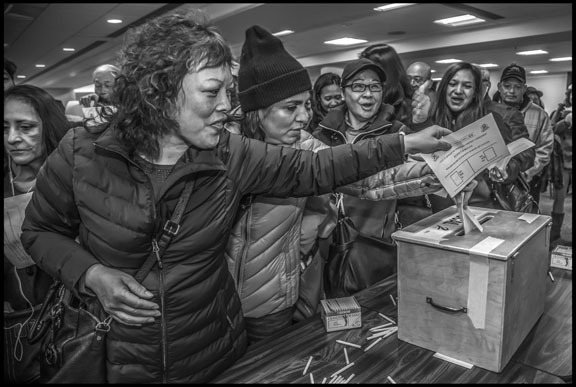 Workers cheer when the vote total is announced. 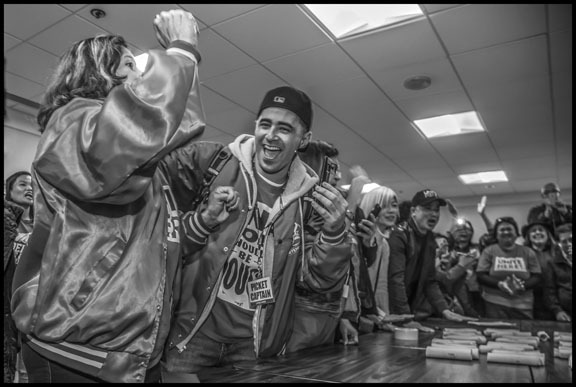 Outside the contract ratification meeting strikers cheer during a press conference to announce the results.